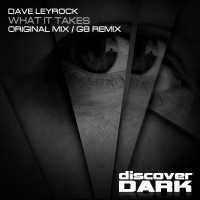 Dave Leyrock is on fire at the moment and we have been lucky enough to be the target. First up was a stunning remix of the G8 single Cathy OMG and then this new single release - the brutally epic What It Takes. Quite simply tech trance at its very best. Faultless arrangement, hard as nails in places but with a piercing main riff that just melts you. G8 returns the remix favour and delivers an intense deep bass excursion that is rinsed with starkness and intensity. The world will only start to make sense when these two do a full on collabaration and we are praying to the darkside that this will happen. 'What It Takes' is available now from Beatport and iTunes.